They offer a variety of different menus from your classic High Tea, a champagne Tea menu, to a tea with more savory items. 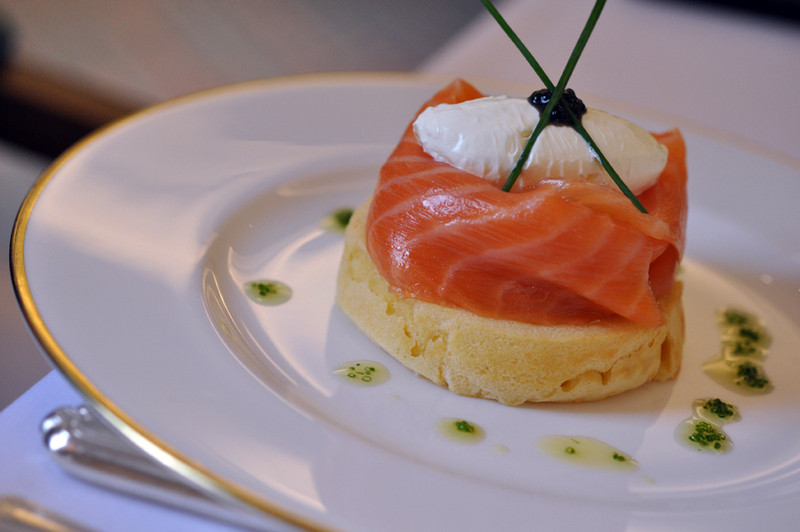 I opted for the latter and ordered salmon blini with crème fraiche and caviar. The blini itself was quite thick, yet felt very light to eat. Piled high on top was melt in your mouth tender smoked salmon, a huge dollop of rich crème fraiche, and a small amount of caviar which was not salty as I had expected it to be. My accompanying rose champagne was fruity and crisp, while the dragon jasmine pearl tea was very smooth. The tea room itself is big, airy and bright, very different than Claridges, which although big, feels very dark. The main attraction arrived next, scones with clotted cream and jam, as well as a variety of sweets. Although I had been looking forward to good English scones and clotted cream, Fortnum & Masons didn’t even provide what I would consider mediocre scones and clotted cream. Their raisin scone fell apart the moment I cut it in half and was dry and floury tasting. The original scone was no better, and the clotted cream was less rich than I was expecting and tasted no better than unsalted butter I could find in Canada. The strawberry jam provided with it was sickening sweet and the lemon curd was more sweet than tart. The biscuits were filled with strawberry jam, far too sweet for my liking, and tasted like an overly sweet shortbread cookie dusted in icing sugar. The sherry cake was filled with cream and cherries drenched in sherry, overwhelming all other flavors. The lemon and praline covered cake was again a cavity waiting to happen. It coated my mouth and tongue, making it impossible to taste anything else afterwards. The only redeeming item was the rose éclair that was filled with airy and light cream inside. At the end of the tea, they gave each of us a small box of Fortnum & Mason's tea to take home with us. To be honest, we were fairly unimpressed that the tea was given to us in small, clear, flimsy plastic cubes since we knew other tearooms like Claridges gave tea out in tins. 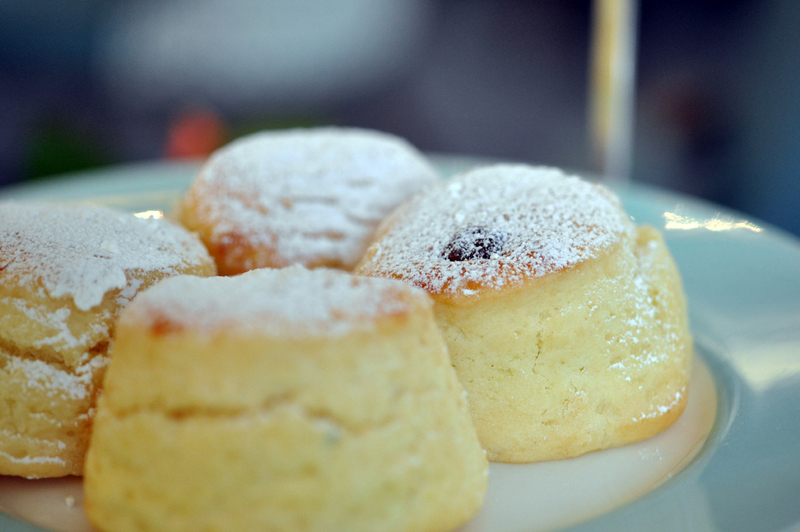 We were utterly disappointed with Fortnum & Mason’s High Tea, not to mention unimpressed with their service. Considering there were only two tables on our side of the salon, the two servers who were dedicated to our side were very slow. As well, instead of explaining the items they brought out such as the sweets, scones and biscuits, they asked if we wanted an explanation. I would recommend that Fortnum & Mason’s review their service standards, and return to focusing on providing service to all guests like they are valued as much as the Royal Family. Particularly when it's not very busy, there's hardly any excuse to not be able to keep an eye on diners to quickly refill water glasses, tea cups, and be available to guests upon a glance, instead of requiring them to flag serving staff down. Also, similar to other high end establishments, I would suggest that Fortnum & Mason’s require servers explain the items they are presenting to diners. This would ensure that no unfortunate food allergy incidents occur with diners. Even though we had mentioned in our booking and when we ordered that the male human had an allergy to alcohol, they never once took the opportunity to specifically point out items on the sweets tray he could not eat. At most restaurants we dine at, if there is ever a time they serve us something with alcohol, they usually mention to him that he should avoid the sauce, or whatever component actually has alcohol in it. So we assumed they would do the same here, however, they didn't. So we had to specifically ask our server what each item was and what was in them. The other table on our side actually had an incident with a nut allergy, and from hearing the girl panic quite loudly, it sounded like they had assumed their server would point out the items she could not eat as well, but did not, therefore assuming everything was safe for her to eat. Granted she could have asked again what the items were and what she could or could not eat. However, if a diner has already made clear that they have a particular allergy - although I'm not certain if she had or not, we however most certainly did - the server should take it upon themselves to remember that and point out items that someone should avoid. As for the food, the scones would have benefitted from more moisture. The sweets are a matter of taste. I'm not a big fan of overly sweet and boozy desserts, however, I'm sure that others are, and it's often difficult to cater and please both of these very different preferences. With the abundance of hotels and restaurants offering high tea, I would advise that you look elsewhere than Fortnum & Mason. Just because someone famous dines there doesn’t mean it’s good. There are likely many less expensive tea rooms in London, that I suspect would provide better service and food than here.